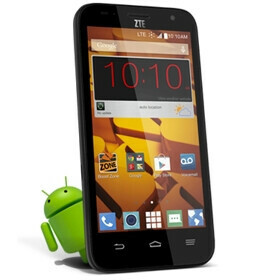 ZTE this week released two new Android smartphones for prepaid customers in the US. The first handset is called ZTE Speed, and can be bought via Boost Mobile for $99.99 (as always, you don’t need a contract when buying handsets from Boost). The Speed runs Android 4.4 KitKat, and is a 4.5-inch smartphone (its screen resolution isn’t known, but it could be 540 x 960 pixels) that doesn’t have impressive features - though that’s to be expected at this price point. The good news is that the device has LTE connectivity, a quad-core 1.2 GHz Qualcomm processor (probably a Snapdragon 400), and 1 GB of RAM. The Speed also comes with a 2 MP front-facing camera, 5 MP rear camera, 8 GB of expandable internal memory, and a 2000 mAh battery. The second new ZTE smartphone is called Zinger, and it’s sold as a T-Mobile prepaid device for just $49.99 (new customers also have to buy a $15 SIM Starter Kit). The ZTE Zinger is smaller than the Speed, sporting a 3.5-inch display of unknown resolution. The handset is powered by a dual-core 1.2 GHz processor, offering 512 MB of RAM, 4 GB of internal memory, a 1500 mAh battery, and Android KitKat. Both new ZTE Android smartphones can be purchased via the source links below. Do you plan to buy any of them (maybe as a backup phone, if not as your daily driver)? I don't understand why these phones deserve a space here in PA.